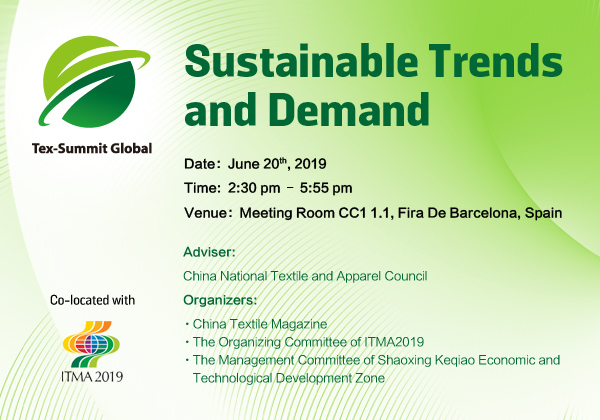 We have a great pleasure to invite you to our ITMA Special “Tex-Summit Global: Sustainable Trends and Demand”, scheduled on June 20th during ITMA 2019 in Barcelona, Spain, organized by China Textile Magazine of CNTAC, and supported by the Organizing Committee of ITMA2019 of CEMATEX. Sustainability is nothing short of dominant factor out of the many contributors to the quality-based inclusive growth of global economy, guided by the United Nations Sustainability Development Goals (SDG) to be achieved by 2030 . This great target, itemized in specific action plans in 17 categorized goals, has implementation schedules, undertaken stepwise as the roadmap leads to cleaner and more resilient economies, to promote prosperity while protecting planet. 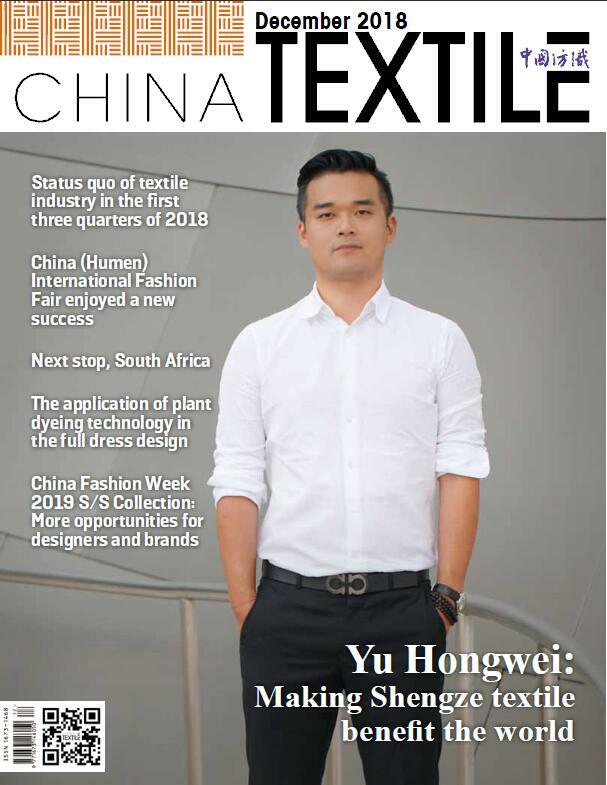 China is a big textile player worldwide and has been very active in innovating its industry boosted by new engines for technological, fashionable and sustainable development, a 3-in-1 growth model backed up by continuous investment in the new equipment that matters! 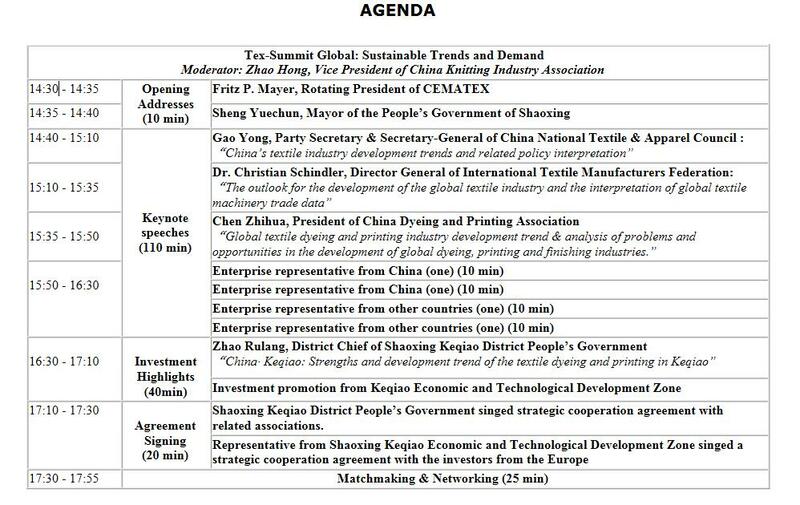 China Textile Magazine of China National Textile and Apparel Council (CNTAC) and The Organizing Committee of ITMA2019 will jointly organize Tex-Summit Global: Sustainable Trends and Demand to provide interested audience with thought-provoking ideas, insightful views, analytical outlooks and practical solutions to address this challenging issue, with respect to China’s textile industry development trends and related policy interpretation; the outlook for the development of the global textile industry and the interpretation of global textile machinery trade data, analysis of problems and opportunities in the development of global dyeing, printing and finishing sectors, intelligent equipment for better quality and clean & green production. It is worth mentioning that, Shaoxing City, the industrial cluster with the largest textile production capacity, the largest dyeing & printing industrial base, and the second largest knitting production base in China, will send a fabric manufacturing group (dyeing & printing manufacturers) led by the Mayor to attend the conference. 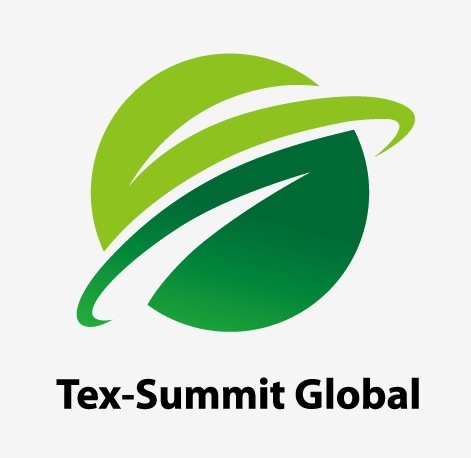 It is with our great honor that we are presenting this letter of invitation in particular to you as a distinguished guest at Tex-Summit Global: Sustainable Trends and Demand. Your presence would greatly be appreciated! China’s textile industry development trends and related policy interpretation. The outlook for the development of the global textile industry and the interpretation of global textile machinery trade data. Analysis of problems and opportunities in the development of global dyeing, printing and finishing industries. How intelligent equipment helps the textile industry for better quality and clean & green production. NOTE: You will kindly be advised of any modifications in the agenda when applicable.